Leveraging on our long experience in the industry, we provide Telescopic & Hydraulic Crane services to our customers. We provide our clients effective service at affordable charges. These cranes we offer are of famous companies including Kato, Grove, Tadano, Denag, Gottwald, P & H, Til and Unic. Our hydraulic cranes are widely demanded in thermal plants, cement plants, nuclear plants, construction areas and many other places. 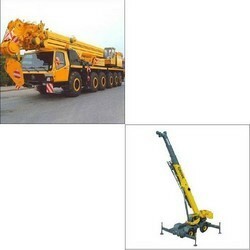 These cranes have a capacity of 150 tones to 450 tones.